Bridge Ratings is out with another update (19 Feb. 2007) of their projections on digital audio growth. I've linked to earlier updates before and have found them very useful. 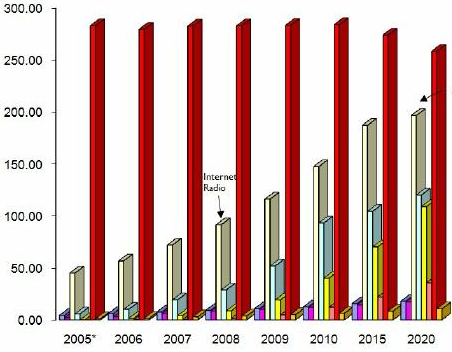 Note the tallest bars (red), which are terrestrial analog radio, and the next tallest bars (white), which are Internet radio. Much more information in the release. A related report is the 2007 Competitive Media Usage Overview based on a 3,500-person 12+ national survey. Check out the comparative weekly TSL chart. Other recent studies include In-Car Media Use, which shows that other in-car media -- especially cell phone usage -- have been eating into TSL to radio since 2003. Traditional media companies will continue to struggle to maintain their audiences. TVs, computers and other digital devices will begin to morph. Technology will make it easier to find, access and manage content. Digital video will drive the growth of on-line advertising. Advertising in digital venues will become more contextual. Small-screen devices will have limited appeal as a media platform. Marketers will make some mistakes as they move into new digital spaces. A couple of those seem pretty obvious, but this is a quite helpful report. Link: BusinessWeek. Maybe a form of WiMAX? Not maybe -- it's here. Leslie Stimson has this report at Radio World. Also see the satellite radio notes at the end of the article. The February issue of Scientific American has a worthy pair of articles of interest to broadcasters, especially to those who don't want to admit to their chief engineers that they don't know this stuff already. The links which follow provide only a tease, so you either need to purchase rights or buy the magazine. The first is a short article by Mark Fischetti called Song Beams that does a particularly good job explaining the urban repeaters for Sirius and XM. The second is a more complete article by Michael Antonoff called Digital TV At Last? which, not surprisingly, is about the transition from analog to digital television broadcasting. Fred Jacobs links to a fascinating study by Katz Radio of satellite radio penetration in major markets. The study concludes that, on the average, Sirius and XM combined would rank #22. Link: JacoBlog. Did you hear what Howard said this morning?